Serbian History 101 - Galveston, TX Church History History of Sts. Constantine and Helen Orthodox Church by Mimo Milosevich, or more formally: Layman Milivoy Jovan Milosevich a gift to all of us for Serbian Christmas, January 7, 2010. God bless Mimo and all Members of Sts. Constantine and Helen! a gift to all of us for Serbian Christmas, January 7, 2010. God bless Mimo and all Members of Sts. Constantine and Helen! His father was an Athenian Greek. When the first outbreaks of Greek Independence from the Ottoman Empire started on the Peloponnese Peninsula, his father, a fisherman crossed onto the peninsula to join the forces of famed Greek General Theodoros Kolokotronis, from a town in the middle of the Peloponnesus called Theraki. Eight years later, when Independence was achieved (with great help from the Allied Russian, English and French Forces); he settled in Egio (one of the oldest cities in the Balkans), Peloponnese Peninsula, Greece. Born in November of 1833, young Theodoros was named for the famed Greek General. They called him “Theos” and he celebrated his Name Day each September 22nd (Julian Calendar in the 1800’s), on the Feast Day of St. HieroTHEOS, the Student of Saint Paul, the Apostle, who in 53 A.D. became the First Bishop of Athens. Theodorus grew up fishing with his father, and spending time around the port; while his mother (a native of the Peloponnese Peninsula) pushed him to the Church. The era after Greek Independence was wrought with economic problems and the Armenians and Bulgarians had replaced the Ottomans as bankers and merchants, allowing our young Theos to become ever more acquainted with other cultures. Two-thirds of the population had vanished and the land was devastated. His early schooling was in the Church of Panagia Trypiti that is built inside a cavity of the cliff just 150 stair steps above the Port of Egio and he helped the Priests with all their duties, occasionally traveling into the local mountains to visit Agia Lavras Monastery, about 20 miles south and up in the mountains. Greek Independence had started there with Bishop Germanos Declaring Independence with his blessing of the troops. Later the Ottomans burned the Monastery, but it was reconstructed with help from the Russian Orthodox Church. Many of the Icons there were gifts from the Russian Monastery Panteleimon on Holy Mt Athos and the Be-jeweled Gospel in the Monastery was printed, signed and given by Catherine the Great of Russia. History and multi-ethnic cultures literally surrounded him. As a young adult, he was Tonsured a Monk and was given the name Theoclitos. He soon traveled to Mt Athos where he was accepted as a resident of the Panteleimon Monastery, where he became fluent in Slavonic and studied Russian language and customs; and made regular visits to the Serbian Monastery Hilandar learning the Serbian language and customs. He had become fascinated with languages. He was invited to complete a formal education and become a teacher at the Slavic Greek Latin Academy and Theological Seminary at Holy Trinity – St. Sergius Monastery, better known today as the Moscow Theological Academy, just outside Moscow, Russia. After under-graduate, a Graduate Degrees in Theology and a few years of teaching; he was called upon by the new Danish born King of Greece, George I, to tutor his son Prince George. Later, the King’s brother-in-law, Tzar Alexander III of Russia called upon him to tutor the Royal Family’s 6 children specifically in other Orthodox cultures including the Greek language. So, he became a Greek cultural teacher to the future Tzar Nicholas II of Russia, who was Canonized a Martyr Saint of the Russian Orthodox Church in 1991. It is also said, Fr. Theoclitos was one of the 30 or so clergyman serving at the wedding of Nicholas II and Alexandra Fyodorovna, who was Canonized a Martyr Saint of the Russian Orthodox Church in 2000. It is known that with the outset of the American Civil War, a group of multi-ethnic Orthodox Christians were having regular prayer meetings in Galveston, as early as 1861, and they called themselves “the Parish of S.S. Constantine and Helen”. Galveston is a seaport, and its citizens were accustomed to our Eastern European and Mediterranean People. Our Eastern Orthodox Christians were always around the port. There were those that came, returned home and came back again. The first known Serbian in America lived in Galveston for a long time; his name was Djordje Sagic (aka: Djordje Ribar and/or George Fisher). He came to Texas in the late 1820’s after “jumping ship” (because of indentured servitude) in Philadelphia, and became the first Port Director of the Port of Galveston under the Mexican Government. He then became a Major in the Texas Revolutionary Army under General Sam Houston. He served in public office as City Councilman in Houston, Texas and Justice of the Peace in Harris County after the Texas Revolution. Sagic had studied for the Priesthood in Karlovci Serbia, but left the seminary to join the last efforts of the first Serbian uprising against the Ottoman Empire in 1813, lead by Serbian leader, Karageorge Petrovitch. He left the area in 1850 to ultimately retire in San Francisco, California as a Justice of the Peace and retained the status of the Official Greek Government Consul there until his death, in 1873. He knew 13 languages. The First known Greek in Galveston participated in the Parish Church group. He called himself only by the name of Captain Nicholas. Captain Nicholas joined the notorious Privateer Jean Lafitte in New Orleans, when Lafitte sailed for Galveston, as Capitan of Lafitte’s prize schooner the Mirabella. Captain Nicholas sailed away from Galveston with Lafitte after burning everything they left behind. Captain Nicholas returned to Galveston after Lafitte’s death, becoming a farmer on west Galveston Island and recounting old pirate stories at the waterfront. He lived more than 100 years and is believed to have died in the Hurricane of 1900. Some have said that with Lafitte came the first of many nationalities to Galveston, but I am unable to corroborate any other Orthodox Christians. During the late 1880’s and early 1890’s these Orthodox Christian Serbian, Russian, Greek, Bulgarian, and Arab (Lebanese) immigrants to Galveston had organized and started gathering monies for a church. Aside from the religious group, they each started several individual nationalistic groups. Each had separately written many petitions to their former Bishops back home for a Parish Priest and had received only denials; justified by the facts of distance and costs, but these denials were in some cases including the suggestion that they petition the Russian Orthodox Mission Diocese in North America. So the culture in Galveston was ripe for the addition of an Eastern European & Mediterranean Priest of Arch. Fr. Theoclitos’ stature. Nicholas II became Tzar of Russia on November 26, 1894. The Romanov Royal Family had created and supported the Russian Orthodox Mission into North America through Alaska since 1784. AT THAT TIME, BECAUSE OF THE ROMANOV FAMILIES’ TRULY UN-MATCHED WEALTH, THE RUSSIAN MISSION INTO NORTH AMERICA WAS THE ONLY ORTHODOX JURISDITION ON THE CONTINENT PRIOR TO 1922. So, the Slavs, headed by Risto Vukovich; and the Greeks headed by Athurs Menutis gathered and decided to petition the Russian Mission Diocese. They sent three telegrams written in Cyrillic and signed by Vukovich, Christo Chuk, and Milosh Porobich which explained the diversity of the parishioners to; (1) the Holy Synod of the Russian Orthodox Church, (2) Tzar Nicholas II personally, and (3) His Grace Bishop Nicholas in Sitka, Alaska. A short time later the parish board received a telegram personally from Tzar Nicholas II, stating his acceptance of their plea. The Tzar had a large Gospel Printed, all the Vestments and Liturgical necessities including a signed Antimins, and all the Icons for an Iconostas painted and assembled including the icon to be used for the name day of the future Church (His own Namesake, Saint Nicholas); and he chose his teacher Fr. Theoclitos to go to Galveston, telling him “Let there be an Orthodox Church in Galveston”. By this time, Fr. Theoclitos was 61 years of age, was a well traveled man and spoke more than a dozen languages; Greek, Russian, Serbian, Slavonic, Latin, Bulgarian, Arabic, Hebrew, Danish; and some Spanish, English, French, German, and Romanian. The Ambassador of Russia to the United States acquired U. S Citizenship for him even before he left Russia! Prior to leaving Russia, Fr. Theoclitos was given the heavy cross he always wore by Tzar Nicholas II and he was elevated to the rank of Right Reverend Archimandrite, because he would soon be the Priestly leader of a flock of Christians so far away with little known chance of a visiting Bishop anytime soon. His journey to the far off land of Galveston, Texas began with six companions. With him were; the Very Reverend Archimandirte Rafael Hawaweeny (Glorified a Saint in March of 2000 by the Orthodox Church in America) and his three Deacons Constantine Abu-Adal, Istvan Moldowanyi and John Shamie (later Shame was a Priest in Galveston); and Archimandrite Fr. Theoclitos’ two Russian Deacons, Theodore Pashkowsky and Joakim Zubkowsky, and his Romanian Deacon Pavel Grepashewsky; and Fr. Peter I. Popoff. First leg of the trip was by train to Berlin, serving liturgy there at the Russia Embassy Church; then on to the Port of Bremen. Next leg was by passenger ship to Southampton for a change of ships, then on to New York aboard the passenger ship, S.S Havel out of South Hampton, as a United States Citizen. Only 82 passengers sailed that day. Although a group of Priests were at the port of New York to greet them on the Morning of November 14, 1895, they were required by customs to spend one night in Quarantine. The Next Morning, they were joined in New York by Bishop Nicholas Ziorov of the Russian Orthodox Mission in America to consecrate the First Arab-Syrian Orthodox Church in America under the Russian Mission’s jurisdiction, and to install Archimandrite Rafael as Pastor, with his three deacons. A few days later, Arch. Fr. Theoclitos, his three Deacons; and Fr. Popoff traveled with Bishop Nicholas by train to Washington D.C., then to western Pennsylvania, where Fr. Popoff was to serve and then on to Kansas City. At this point, it was decided that only the Romanian Deacon Grepashewsky would travel to Galveston with Arch. Fr. Theoclitos; and Bishop Nicholas and the other two Deacons would go on to San Francisco. Arch. Fr. Theoclitos stopped in Hartshorne, American Indian Territory, Oklahoma to have Liturgy for a group of Russian Miners, just outside of Tulsa, Oklahoma before reaching Galveston. The distances from Galveston to either San Francisco or New York are about 1600 miles. Although his rightful rank was high, which gave him the right to consecrate his own chapel including the right to wear a Mitre (Crown, but with a flat, not standing Cross on top) and carry a Pastoral Staff (Bishop’s Staff); he lived his life in Galveston as a meager Monk, teacher, and Pastoral Priest. The Church Congregation never paid Arch. Fr. Theoclitos, because he received his pay directly from the Tzar (1500 rubels a month and 500 rubels as expenses; about $120 total, at that time) until Arch. Fr. Theoclitos passed away in 1916, a year and a half before Tzar Nicholas II and his Family were murdered. The Trustees of The Existing Congregation Board (Chris Vucovich, Chris Chuoke, Athurs Menutis and Mitchael Mihaloudski) formally received their State Corporation Papers on January 13, 1895 and subsequently purchased a 43’ wide x 120’ deep property that is at 4107 Avenue L, Galveston, Texas on December 15, 1895. They started to build a rectangular wood frame Orthodox styled Church, and when Arch. Fr. Theoclitos arrived, in January of 1896, he directed the finishing of the Church. The congregation was astonished to be blessed with an Archimandrite and a Deacon, not just a Priest, and best of all he was somewhat of a linguist. In Galveston, all properties faced either North-west or South-east, so they had chosen property that leaves our Church unusually facing South-east. And, although the Icon of Saint Nicholas was placed in the Iconostas to Honor Tzar Nicholas II as the Patron of the Church; it was Arch. Fr. Theoclitos’ decision to use the name S. S. Constantine and Helen Church, because the congregation that started on its own should be remembered. 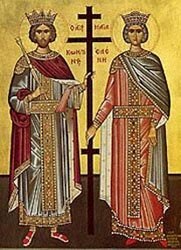 Bishop Nicholas was invited and he accepted; and the Consecration of our church occurred on June 3rd 1896, the feast day of Sts Constantine and Helen. Arch. Fr. Theoclitos’ decision on the name of the Church, was not unusual with him. He was known to have baptized children with names other than their parents had asked for. 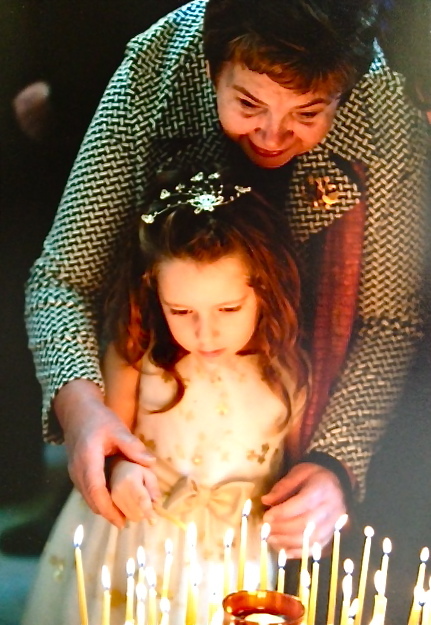 My mother’s name was to be Ruza, Serbian for Rose, but he baptized her as Sophia which her parents accepted without question, and gave my mother and others an unusual lifelong connection to their Archimandrite. But then, his guidance and decisions were always accepted by his congregation. There have never been any questions of his guidance that were ever passed down through the years even though we Eastern Europeans have always loved a good argument. He had services in the Slavonic, Greek and Arabic languages. It was as though his congregation was standing with a Saint. In 1897, Arch. Fr. Theoclitos purchased a 36 plot track in the Lake View Cemetery as a gift to his Congregation. He buried his flock in the next consecutive plot, without regard to couples or children or any Relationship, because he saw them as one congregational family. In early 1897, Bishop Nicholas replaced Deacon Grepashewsky with a young Russian Monk, Fr. Mikhail Kurdinovski to allow Arch. Fr. Theoclitos time to travel and invited Arch. Fr. Theoclitos to San Francisco to speak in the Greek language on the mounting losses of the Cretan insurgents in their revolution against Ottoman rule. Bishop Nicholas had to be acutely aware that his Archimandrite was the highest ranking Greek born Clergyman in America. While in route, we know that he also served Liturgy again in Oklahoma; and in Denver, Colorado. After his sermon in San Francisco he was asked to traveled with Fr. (later, Archimandrite) Sebastian Dabovich (currently being considered for Canonization as a Saint), to Portland, Oregon and Seattle, Washington, where they served Liturgy in Slavonic, Greek and Arabic in both cities. He again traveled to San Francisco in 1898, to participate in the installation of Bishop Tikon Belavin, as the new Bishop, replacing Bishop Nicholas of the Aleutians and Alaska (Diocesan name was changed in 1900 to Diocese of the Aleutians and North America). Although little is known about it, Bishop Tikon visited our parish in 1899, for the first of two visits. It’s known that Arch. Fr. Theoclitos traveled extensively on the Gulf Coast going as far east as Mobile, Alabama, as far south as Corpus Christi, Texas, and into the interior north to Ft. Worth, San Antonio, San Angelo and Austin Texas, performing Marriages and Baptisms and serving Liturgy where ever he found our Orthodox Christians. In 1897, The Wiemar, Texas newspaper had an article about him; where he borrowed the local Catholic Church in LaGrange, Texas to perform the wedding of a Greek Couple. The writer (obviously Protestant) posted the short article that follows. LaGrange, Tex., Jan. 25, --Married today, Mr, Abraham John to Miss Zeche Nemer, both Greek, at the Catholic Church by Rev. Theoclitos (Archimandrite of the Orthodox Church), Galveston, Tex. A very large crowd attended the ceremonies, which were “somewhat of a novelty”, no such ceremonies having ever been performed here. Our Church Board additionally purchased a like adjoining property west of the Church doubling the size of the property in early 1900. But, in his 66th year, on September 8th 1900, Galveston Island was hit by the greatest natural disaster in United States history when the massive Hurricane of 1900 came ashore. The Island was almost totally destroyed (est. of 8,000 to 12,000 deaths of a population of 30,000, which included 24 members of the congregation. Arch. Fr. Theoclitos and Fr. Mikhail spent 30 hrs in the church praying and giving refuge to parishioners and neighbors that sought safety in the church. After the storm had passed, the Church structure was still standing although it had floated to the west about 10 feet partially onto the additional property just purchased. Those that were with him in the church believed Arch. Fr. Theoclitos and his church had truly saved their lives. The congregation gathered and raised the Church, repaired the damage and early in 1902 petitioned Bishop Tikon, who had since moved the headquarters of the Diocese to New York, to visit and Re-consecrate their repaired Church. Bishop Tikon accepted and arrived shortly before services on June 3rd 1903. This event made Arch. Fr. Theoclitos and his congregation’s church not only patronized by, but also consecrated by future Saints of Orthodoxy. By order of Tzar Nicholas II, Bishop Tikon bestowed on Arch. Fr. Theoclitos the Royal Honors of (1) the Order Of St. Vladimir and (2) the Order of St. Anne (in his picture, the ribbon and cross like medallion around the neck to his right side is the order of St. Vladimir, the ribbon and medallion around the neck to his left side is the Order of St. Anne and the necklet with the large medallion was awarded him upon attaining his Graduate Degree in Theology from the Moscow Theological Academy. While in Galveston, Bishop Tikon visited the cemetery, and became aware that it was filling fast. As a gift to the Congregation, Bishop Tikon,who was later made Patriarch of Moscow, purchased 27 additional plots next to the original cemetery track. Arch. Fr. Theoclitos and the Church continued with a new influx of immigrants coming to Galveston each year, even purchasing another 21’ to the west of the Church. Although he did keep constant communications with the Diocese, it is not clear whether he ever met with Archbishop Platon of New York, who replaced Bishop Tikon. He was known to include the Romanov Royal Family each week in the Liturgy, as: (1) word of Tzar Nicholas II’s son, Alexander’s affliction with hemophilia began to spread, (2) World War I was building and (3) talk of revolution against the Tzar was in the news from time to time. Also, because of our multi-ethnic culture in Galveston, the shot by Serbian Gavrilo Princip that assassinated Arch Duke Franz Ferdinand and his wife Sophie, (believed to be the shot that started World War I, was heard loudly in our Church making the War and the assassination more than an important issue. On weekly trips to the business district, the neighborhood children would gather on the church steps and wait for his return. He would always have a large bag full of fruit and the latest sweets for them, saving a large portion for his parish children. He became acquainted with many people during his years in Galveston and was thought of respectfully, while they became somewhat enchanted with his customary meager but stoic Orthodox Monastic ways. He was a constant visitor to St. Mary’s Infirmary (the local Catholic Hospital) and John Sealy Hospital at the University of Texas Medical Branch. Following his heart, as the Apostle St. Paul guided him through his Name Day St. Hierotheos, he was known to give Confession, Baptizism and Communion to anyone who professed to be Christian. He truly became a friend to many families, who felt his visits to their loved ones in the hospital made those loved ones better. He converted to Orthodoxy many of these families: the Dambido family, the Matthews family and the Lelirra family to name a few. In 1911, the Galveston-Houston Inter-Urban Train was instituted, allowing many of our Orthodox Christians in Houston (50 miles north and largely Greek and Lebanese) an ease of access to Galveston for Sunday Liturgy. The trains were one or multiple electric cars that ran from downtown Houston to downtown Galveston, and you could get on or off at any time. So, our members could get off, then on again, less than 800 feet north of the Church on the main road into Galveston. It was still a 75 minute trip, one way, but it was an inexpensive way for our Houston parishioners to get to church from time to time. It was later discontinued in 1936. And then, in his 81st year, the Island was hit by another devastating Hurricane in August of 1915. Again, Arch. Fr Theoclitos and others prayed in the Church. This storm was even more tenuous for them, but never was anyone in the church lost in any storm. The Church floated to the north about 50 feet into the street, and the front wall was torn open and the Gospel given by Tzar Nicholas II was found by parishioner George Mandich another 200’ away in the city cemetery across from the Church, miraculously with very little water damage. The congregation repaired the Church and moved it back into place with mule and muscle. The parish again, needed more future graves. This time, as a religious benevolent society, they purchased their own private Cemetery in the western part of the city, about a quarter mile from the other cemetery. The land was far larger (would easily accommodate about 300 graves) and would meet their needs for long years into the future. But they also divided it into two sections, the Greeks to one side, and the Serbians and other Slavs on the other. Later in the following year, the Church was hit by the loss of their 21 year life with Arch. Fr. Theoclitos, just short of his 83rd year, on October 22nd 1916. He had become gravely ill six weeks before. He somehow knew his time was near, and had the Diocese notified of his illness, and he asked parish leaders to find a way for them to bury him under the Altar of the Church. It was his belief that his grave would, by its nature, cause the Church to continue at the location for centuries into the future. He passed to his Creator at 8:15 in the evening, in St. Mary’s Infirmary Hospital. With the help of Church leaders, his body was prepared by Malloy & Sons Funeral Home, but the parishioners then took the body to the church and stood vigil over his remains continually, until his Funeral. The New Archbishop Evdokim of New York ordered his Diocesan Secretary, Archpriest Fr. Peter I. Popoff (who had been one of Arch. Fr. Theoclitos’ companions on the trip from Russia), and two others of his Diocesan Council members; Fr. Louniky Kraskoff of Denver, Colorado (whom he had visited with on trips to San Francisco) and Hieromonk Fr. Paul Chubaroff of Hartshorne, Oklahoma to immediately travel to Galveston so that Our Beloved Archimandrite would be religiously cared for. They finally arrived in Galveston six days later, on the morning of October 28th. Hierarchical Funeral Services were held that afternoon at 2:00 P.M.
During the six week wait, the Parish Board had received permission from the County Judge to place his remains under the Church’s Altar and workers prepared the Concrete Vault that was required by the Judge for his casket to be encased, where it remains today. As Arch. Fr. 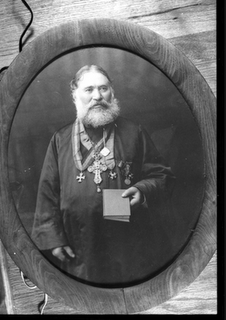 Theoclitos requested in his will, his Cross and Medals were all taken to Archbishop Evdokim by Archpriest Popoff. In the following years our Church was served by numerous short-term or as they were called in those days, traveling Priests. In 1929, the parishioners, spear-headed by Petar B. Kovacevich, built a wood frame Hall (32’ X 75’) with a parish home above, in hopes of having a Priest and his family, stay in Galveston. It helped, but, in 1933, our Greek brethren gathered and purchased their own Church, The Assumption of The Virgin Mary Greek Orthodox Church. Our parishes have helped each other thru the years, whenever either was without a Priest or there was a time of need, as our Arch. Fr. Theoclitos would expect of us. The Hierarchs of the Church in those years were Archbishop Alexander,Metropolitan Platon, and Metropolitan Theophilus. In 1934, Fr. Alexis Revera and his family arrived in Galveston and stayed for 27 years. In 1948, the parish decided it was time for the Church to receive some upgrades, mainly in the form of cosmetics. Wing additions were added to the elevated Altar area, the interior was totally painted, Stain Glass windows were added, hard wood flooring, a new roof coving, and the old siding was covered with a light brown brick; work was completed in 1949. The parish petitioned the Diocese, and in 1950, the newly elected Metropolitan Leonty, traveled to our fare city to re-consecrate the Church. Air-conditioning was added in the 1960. In 1962, it had become apparent that the community was almost totally made up of Serbians. Metropolitan Leonty and Bishop Dionisije (right) of the Serbian Diocese met and sealed an agreement that put our beloved Church under the Serbian Diocese, while the Russian Diocese would receive under its control the Church in Billings, Montana, which was started by Serbian Bishop Nikolai (Canonized a Saint by the Serbian Orthodox Synod in 2003,) and Archimandrite Fr. Sabatian Dabovich; but had over the years become almost totally Russian. They further agreed to guide these two parishes to remain multi-ethic and services were to be in both English and Slavonic and should include a litany of any other languages when needed for other ethnic parishioners. In 1964, the Texas Highway Department was working on plans to expand the street next to the cemetery into a 6 lane highway. They were intending to put an over-pass over the Serbian Section. Two parish leaders, Ilija P. Kovacevich and John N. Milosevich went to the highway department with their plan to move the Serbian Section at the Highway Department’s expense. The Highway Department agreed. So, it became the work of parishioners; lead by local Constable and parishioner Sam Popovich to get every relative of a loved one in the Serbian section to sign the necessary papers. The highway department would provide 6 times the land they were taking and would bare all expenses of exhumation and reburial; where a solid caskets or a vault was not found, the earthen material would be placed in a vault to be transported; and the Priest would attend and be paid for a service of exhumation and re-burial for each grave. The new cemetery is much like a Church with a center aisle and rows of graves to each side; with small side-walks between the rows and an Alter table at the front. In 1978 our Parish came under the Jurisdiction of one of it’s own, Serbian Bishop Christopher. The First American Born Bishop to serve an American Diocese. He was born and raised in Galveston and had been ordained a Priest of the Serbian Orthodox Church in 1949. With his leadership, the congregation has prospered through the past 30 years, with him becoming Metropolitan in 1991. Now we have been hit by another devastating Hurricane “IKE”, which came ashore on September 12th 2008. Our Church sustained minor damage with only a few inches of water inside and some wind damage (no doubt that our Arch. Fr. Theoclitos mystically was riding out the storm in his Sanctuary). But our Hall was in 3 feet of water. The old wood frame structure was left structurally unsound. The Parish decided to fix the Church first. We then had the old hall destroyed, and are planning to break ground on a new hall in early 2010. Our Greek Brothers and Sisters, didn’t fare as well, their beautiful Church was inundated with 8 feet of sea water. The masonry Church and hall structurally survived, but the interiors didn’t make it. They are without a Priest, but have managed to somewhat re-do their Church and are working to completion. During this time, they have attended Liturgy on Sundays with us, and now that their Church is presentable, our priest Fr. Srdjan Veselinovich has liturgy on Saturdays for them. In 2009 our parish was placed under the jurisdiction of His Grace, Serbian Bishop Longin, ending an over 40 year schism in the Serbian Orthodox Church in America. Interestingly, His Grace Bishop Longin and Arch. Fr. Theoclitos, both received Graduate Degrees in Theology from the Moscow Theological Academy at Holy Trinity – St. Sergius Monastery (name changed to Zagorsk Monastery in 1930). And so, 168 years after the first parish meeting in Galveston, Texas, we beseech Our Archimandrite Father Theoclitos Triantafilides; his friends Archimandrite Saint Rafael Hawaweeny and Archimandrite Sebastian Dabovich; Our Patrons Saints Tzar Nicholas II and Saint Trazistza Alexandra, Our First Metropolitan and Patriarch Saint Tikon Belavin, our first Serbian American Bishop Saint Nikolai Velimirovich and all those who with the Saints have guided our Parish in their goodness, to intercede on our behalf for yet another Century of existence. Marriages, Baptisms and Celebrated Liturgy in the following locations in America. He was the answer to our predecessors every prayer. He traveled extensively on a global basis to serve the religious needs of many. He provided the “Connecting Link” for our multi-ethnic American lives, and through the teachings of Orthodoxy and his God-Given Art of Language, he lead us on the path of Saint Paul, the Apostle, past the ever separating ethnic divide. "This picture of The Right Reverend, Most Venerable Archimandrite, Fr. Theoclitos Triantafilides is the only one I am aware of. He was the first Orthodox Priest in Texas. The picture did hang with Honor in the Church Congregation Hall of Saints Constantine and Helen Church in Galveston, Texas. It has been saved from “Hurricane IKE’s Destruction” (September 12, 2008), and will hang there again when the new hall is constructed soon. I live in Galveston, and I have been a part of the Church congregation since Baptism. My Mother was baptized by Arch. Fr. Theoclitos and was very proud to tell people of that fact until her death in 2001. I have studied everything I can find on this wonderful Priest over the years, including his Last Will, the Galveston Daily News archives, Immigration Records, the Rosenberg Public Library of Galveston, the Church records (Slavonic, long-hand written in Cyrillic), the Internet and greatly on the local “folklore” stories told of him. Currently our parish is served by Fr. Serge Veselinovich, who has been rector since October 1995. Liturgy is served each Sunday at 10:00 a.m. Call for Lenten and Festal service schedules. Fr. Serge can be reached at 281-412-6911. Your site is so inspiring to me....all aspects of it....including famous Serbian Americans. Mimo's father, John, is first on the left. 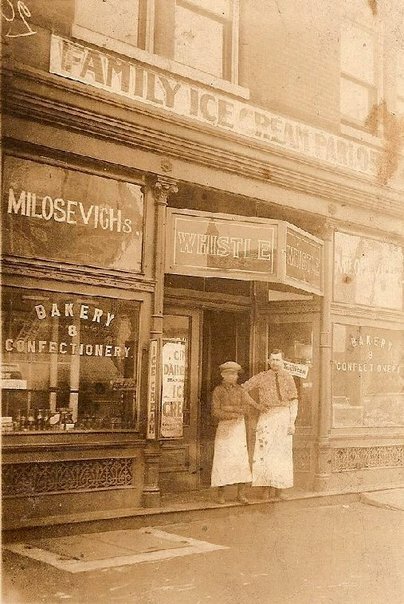 Mimo's grandfather's store in St. Louis. Mimo's father John, & cousin, outside. 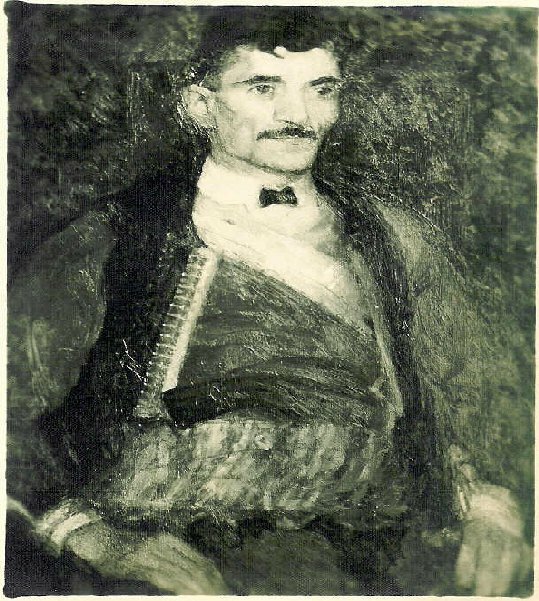 "Djedo asked him to do a portrait of him in his Serbian outfit.....leevor (pistol) and all in 1929. "Tonasko painted it and my cousin Tanya Sansone has it in Phoenix, Arizona. "My Djedo died in 1931. "Any way.....my cousin Tanya and I would always wonder where that painting was....and even before my dad died.... I tried to to fine where it might be today.....i wrote an inquiry to all known art dealers on the Internet back in 1997. 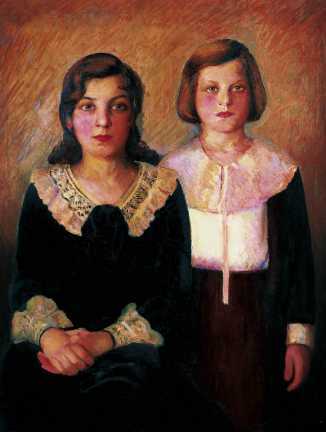 Mimo's two aunts... Strina Mara & Strina Jelena, painted by famous artist, Tanasko. "Five years later I heard back from a company called Treadway Galleries in 2002. They told me it was at one of their galleries in St Louis and I drove to St Louis to buy it....it was not cheap. The painting is now at my (widowed) sister-in-laws house where I evacuated to during the onslaught of Hurricane Ike." "My Uncle Sam (Sava) Popovich was the elected Constable here in Galveston....in Texas. "Constables are the same as US Marshalls under the Treaty that makes Texas a State. "They are the only officers in Texas that can arrest the President of the US. "Anyway Uncle Sam was elected in 1952, and stood for re-election every 4 years until 2000....making it 48 years in elected office....no one person has been elected to the same office more times than my Uncle Sam Popovich in TEXAS....he was known all over texas ....and was a small rancher and hog farmer on Galveston's West End....he was a devoted Serbian & Orthodox Christian....was always a board member of the Church....he was born Jan 27th 1918 (Savin dan)...his funeral was a WHO's Who of political person through-out the state....the county sheriff and city police stop traffic through-out the city for the motorcaid.....he was a big man, about 6'3" and 280 lbs of pure muscle....and "He Never Carried a Fire Arm." The parish appealed to the Holy Synod of the Russian Orthodox Church in St. Petersburg, Russia, and Tsar Nicholas II (now glorified by the Church as a Martyr) decreed “Let there be an Orthodox Church in Galveston.” He then personally donatedthe icons on the Iconostasis, the Gospel book, the sacred vessels, and also sent the parish’s first priest Archimandrite Theoclitos (Triantafilides). 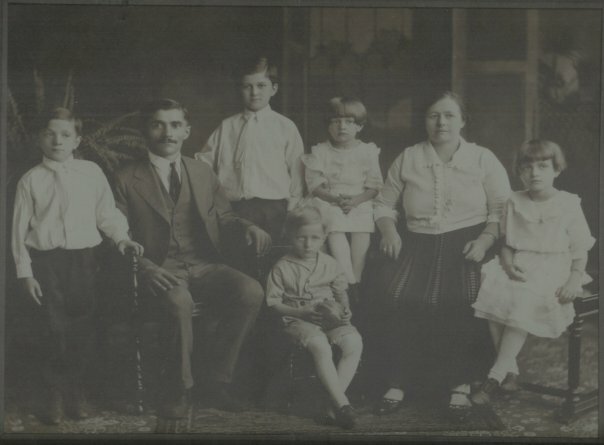 "When your Dad came to Galveston, he would stay at Mimo's parents home most every time. Years before, John-Mimo's dad-would go to the SNF conventions in Pittsburgh and my dad always wanted to go too-but never got the chance. He loved your dad's writings in the Srbobran and always wanted to meet him. From the time I was about 5 years old I remember the magazines your dad published. Daddy would tell me about them but I had to be very careful when I looked at them because he considered them to be very precious. "Oh Mim-=how I wish we would bring back all those wonderful times. As time goes by I think about them so much. The hurricane did so much damage-especially all of the papers -both Srbobrans and Diocesan Observers that your dad wrote about Galveston Serbs. Mimo and I lost all of those treasures in the storm. All the pictures your dad took when he visited down here. Years ago I sent him and Helen some postcards from Greece (1984) and he wrote an article about my trip in the Observer. Wow-so many memories!! Elaine points to a 1936 photo of her Mom and Grandmother as members of the Ladies Social Club Sts. Constantine and Helen Church has decorating their beautiful new hall! Best of all, each lady is named in a brass plaque beneth the photo. Great foresight here! Parishioners admire a 1929 photo of the Building Committe of Sts. Constantine and Helen Church in Texas. Again, there is a plaque with the names in admiration for all the early pioneer immigrants were able to accomplish. Elaine is so proud of the work that Church President Mimo initiated and she helped to make sure all the Serbian graves in the Lakeview Cemetary were carefully marked. If you click the lower right hand side of all of these photos, they will enlarge. This shows the Serbian Orthodox Christian Cemetery to be at 2802 Sixty-First Street, a private, sacred and regularly blessed property! Besides the wonderful old photos of the early pioneers in Galveston, the parishioners also have beautiful copies of famous Serbian paintings, like this one of the MAID OF KOSOVO. Mim and Jocelyn liked this one a lot! 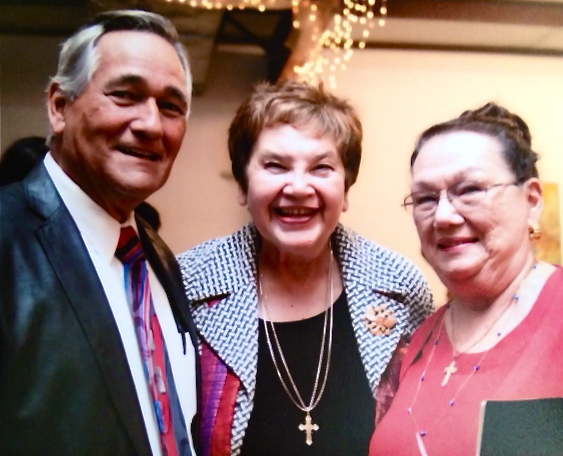 From Olga Trammel of The Woodlands, in Texas, this photo of Mimo, Mim and Elaine at the Consecration of the St. Sava Serbian Orthodox Church in Cypress, Texas, a suburb of Houston, 2012. Jocelyn Bizic in Cypress too!